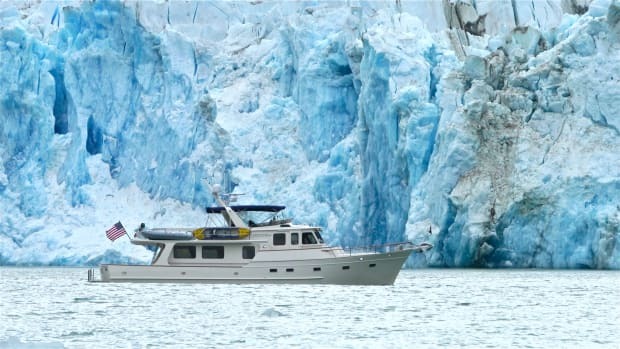 The modern passagemaker has opened up a world of cruising that was once the exclusive realm of professional mariners and adventuresome sailors. Advancement in systems, from stabilization to navigation, has given the trained—but still amateur—boater the confidence to venture farther than they ever have before. Manufacturers have followed the trend by offering more models that are suitable for offshore passages. Despite the comfort offered by today’s modern cruisers, we are still placing ourselves at the mercy of Mother Nature—a force capable of challenging the best-trained crew and most stoutly built vessel. As a longtime training and delivery captain about to begin cruising aboard my own passagemaker, I believe there are two important pieces of safety equipment that have not received enough attention: the speed-limiting storm drogue and the sea anchor. Often confused as the same piece of equipment, a speed-limiting storm drogue and a sea anchor serve two very different purposes. Both are made of high-strength nylon or Dacron, are shaped or have hardware to keep them open to oncoming water, and both are designed to resist the water’s exit to create drag. But this is where the similarities end. A storm drogue is defined as a submerged device towed from the stern of a boat for the purpose of limiting (but not stopping) its speed and for keeping the vessel’s stern at a set angle to following seas. Conversely, a sea anchor is a device deployed from the bow of a boat in an attempt to stop her movement through the water and to keep the bow heading into oncoming waves. The use of drogues is relatively well known as a steering device for sailboats in the event of a lost rudder, but they can have an equally important application to the modern power cruiser. Mariners have known for centuries that dragging something from the stern of the boat will slow it and keep its stern square to the waves. The very word “drogue” is believed to be a derivation of the word “drag.” There have been sketches in ships’ logs and numerous accounts of ships being saved by using a drag device for speed control and for stability in following seas. First, a little bit about hull design in order to understand why a drogue could be particularly useful to trawler owners. 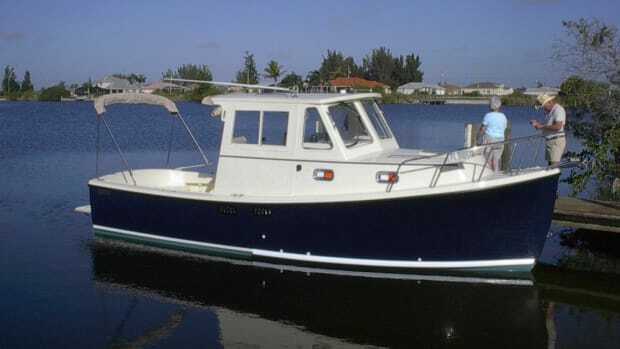 A trawler that has a displacement hull with a non-submerged transom handles a following sea quite well by allowing waves traveling faster than the boat to pass under the hull without pushing her considerably faster, or pushing the stern sideways. However, some of the popular displacement, and certainly the semi-displacement trawlers in the market today, have slightly submerged transoms. This can be for increased space, enhanced stability, or to achieve speeds in the upper displacement range. 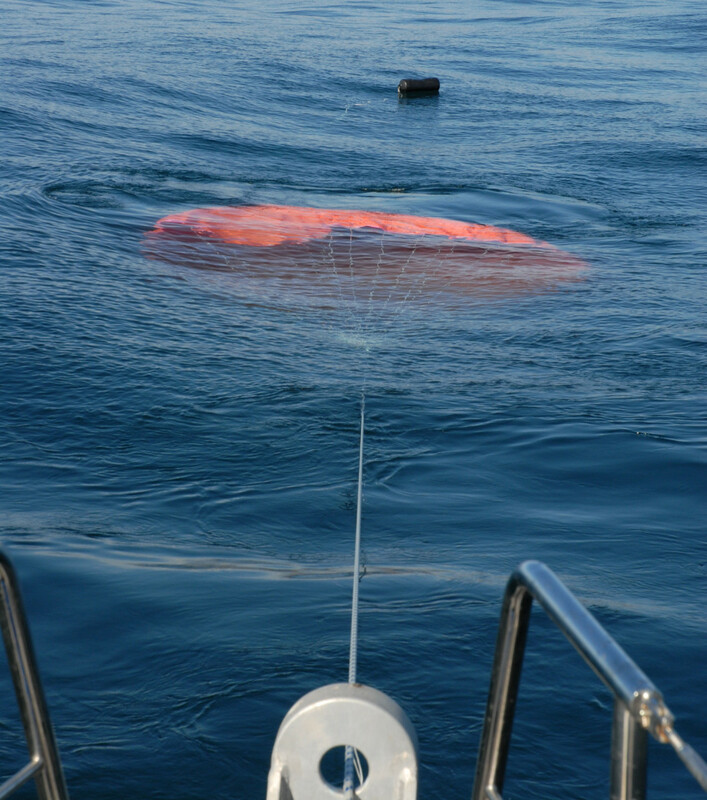 A parachute-style Sea Anchor deployed from the bow pulpit of a trawler. While this design offers useful benefits, it also has an adverse effect on the boat in a following sea. If the boat has enough speed to match the waves, it can control where it is in the wave trough. 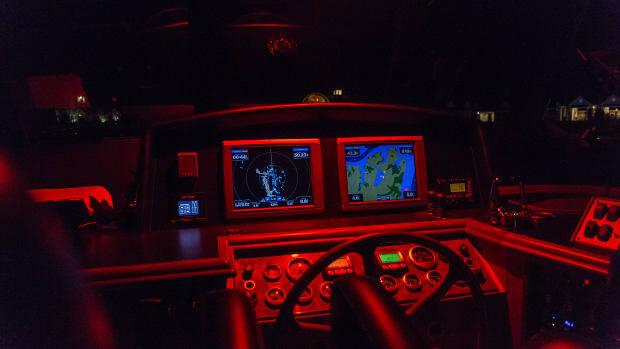 However, many of the popular trawlers with submerged transoms don’t have the speed capable to match, so we have no choice but to allow a following wave to pass under the boat. 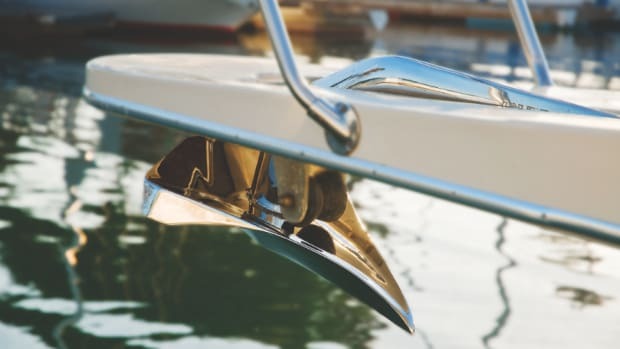 When the wave encounters the submerged portion of the transom and the lower portion of the hull, it has something to push against, causing the boat to increase in speed, or worse, causing it to broach. In most cases, boaters would prefer to run with the waves instead of into them. In a head or beam sea, the boat has a more abrupt encounter with the waves. Not only do you feel them more, you also know if they’re building in height. In a following sea, the waves usually pass beneath the boat with a gentler motion. While this is a more comfortable ride, it can lull an inattentive captain into believing everything is fine right up until it’s not. Let those waves gradually increase without noticing and you could be fighting for control as the boat speeds down the face of a wave. The only way to stop this is to limit the speed of the boat and gain some directional stability from the stern. This is where the drogue comes into play. A properly designed device dragged from the stern not only will slow the boat, but it will help her resist sideways movement. While all drogues available today aim to achieve the same result, there are variations in design and materials. Most are fabric with an opening to allow water in while restricting the water’s exit, creating resistance in the process. 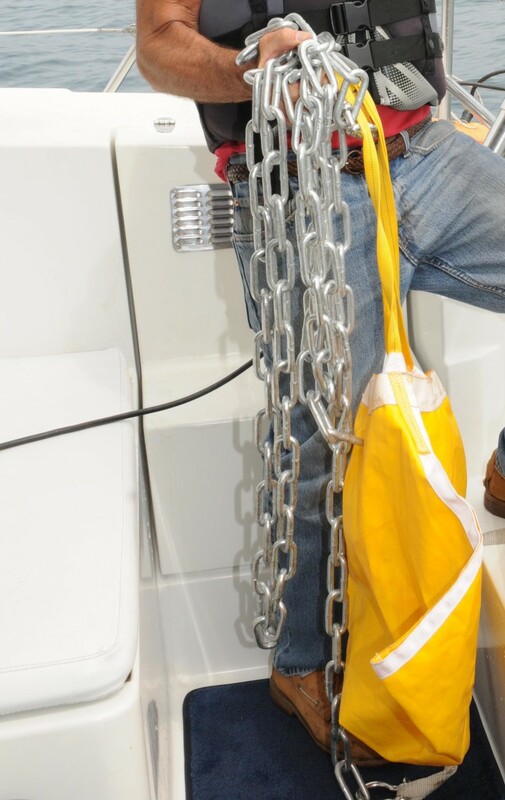 A drogue tied to a weighted chain. Keeping in mind you likely won’t be in the calmest of conditions when deploying a drogue, it needs to be easy to deploy and set. 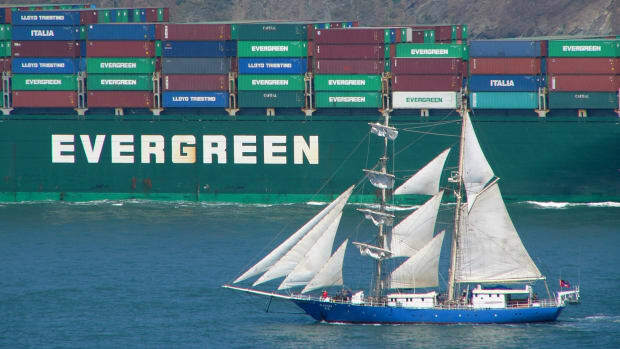 Having a setup ready to send overboard in a single package would be helpful. Sending what could be hundreds of feet of line and 20 or 30 feet of chain over the stern of your boat in rough conditions can be a challenge. The types of drogues that use weights instead of chain to keep them submerged have a big advantage in this area. The popular flat web lines on a spool would also be a benefit in setting and retrieving a drogue. Drogues must be securely attached to the boat. Ideally the drogue is attached by way of a bridle in the center of the transom from multiple points. If the two lines securing it to the boat have a block on one line and a fixed point on the other, you can move the drogue line from one side of the stern to the other like the traveler on a sailboat’s boom. This can assist in keeping the stern square to a quartering sea and could be especially useful maintaining steerage when entering an inlet with a following sea on your stern quarter. The drogue must be equally easy to retrieve as it is to deploy. 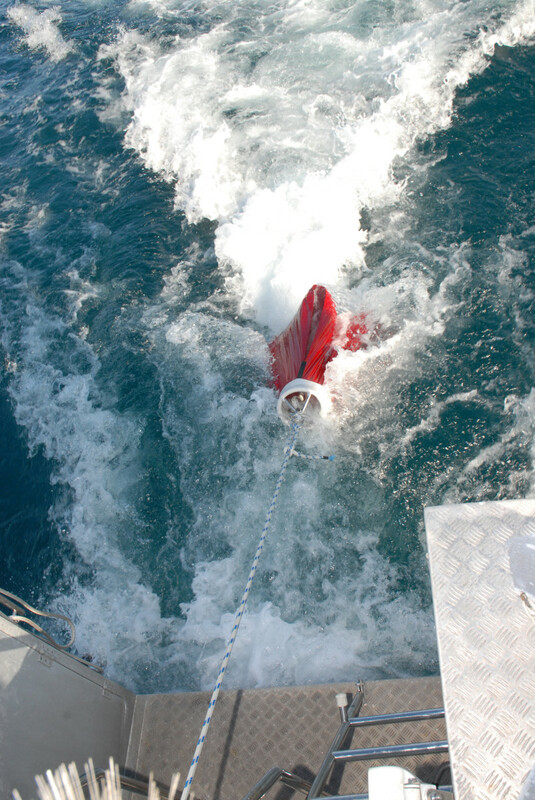 A Drogue deployed from stern of a trawler. The control and stability provided by a drogue can be a lifesaver, but what if you need to come to a complete stop and the water is too deep to anchor? Or, what if you’ve lost power in tall seas and turning beam to the wind and waves could be dangerous? There are many circumstances where you need to keep your bow into the wind and waves but cannot due to a loss of power or another onboard emergency. The answer to all of these scenarios is the first cousin of the drogue: the sea anchor. The most effective sea anchor resembles a parachute, which, when submerged, traps large volumes of water creating the necessary resistance to the vessel’s movement. A vessel without propulsion or the ability to steer the bow into the waves will naturally turn its beam to the wind and waves. At the very least this is uncomfortable in moderate waves and dangerous in significant seas. With a sea anchor deployed from the bow on a similarly long line as the drogue (approximately three to four times the boat’s length), the anchor exhibits drag in the water while the wind and waves are trying to push the boat sideways. When attached to a sturdy point at the bow, the sea anchor keeps the bow into the wind and waves. It also can reduce movement across ground to a near stop. This could be crucial with a loss of power near shore and with wind and waves pushing you toward land. Several manufacturers are producing high-quality versions of these devices. Each has developed and tested its designs to be easy to carry and deploy. Each has ratings for different size vessels and correspondingly sized drogues or sea anchors. Some rate by vessel length, some rate by displacement or a combination of both. Tests by the manufacturers and accounts of actual use reinforce the important factors to the successful performance of these devices. 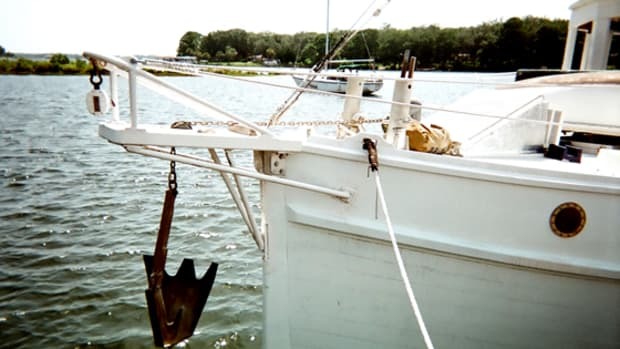 Any sea anchor or drogue must be sturdy enough to withstand the tremendous forces placed on the hardware and stitching, have the ability to remain submerged during use, and be relatively easy to deploy and retrieve. Manufacturers of modern drogues and sea anchors keep detailed accounts of their devices saving vessels and possibly even lives. 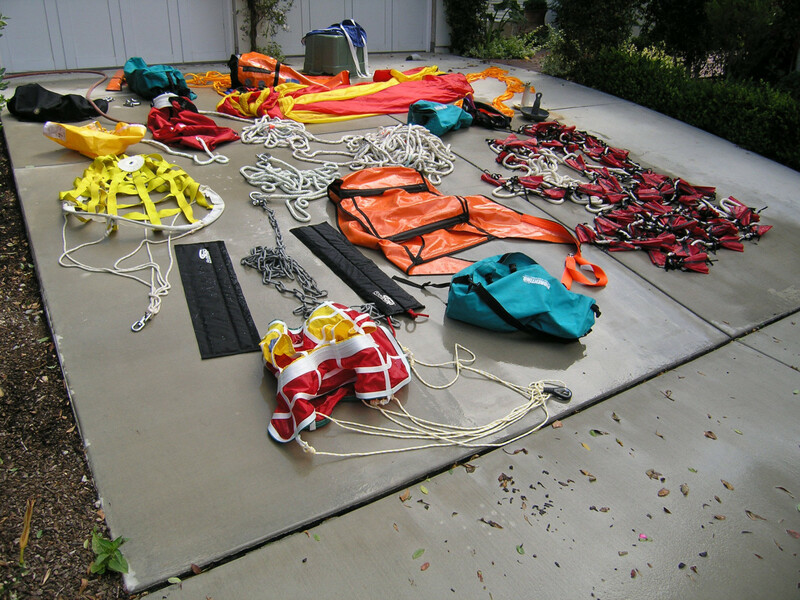 If you are planning any extended passages, whether coastal or transoceanic, a storm drogue and sea anchor are two vital pieces of safety equipment to carry aboard. Several different styles of Storm Drogues are available in oder to suit any type of trawler. Capt. 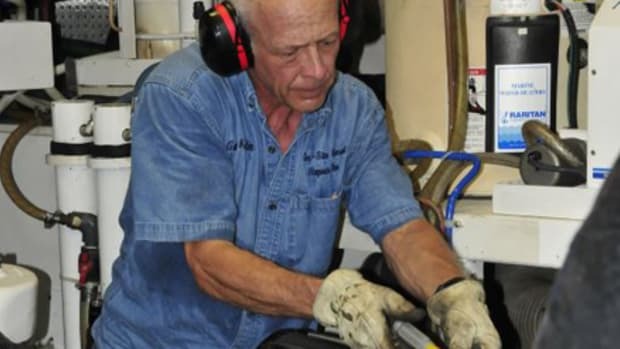 Bob Arrington is a licensed USCG master with 35 years boating experience on the Great Lakes, Chesapeake Bay, and offshore waters of the U.S. Atlantic seaboard and Caribbean. Arrington runs Ocean Enterprises, a maritime business offering trawler-specific buyer and delivery services, vessel handling, and navigational instruction.